Tulips start the long color season for the small garden that might be placed beside a building, along the back fence or used as a link between your terrace and lawn. Periwinkle and candytuft bloom with the tulips, while the irises, daylilies and other perennials are breaking through the soil in early spring. Blue bearded iris and a pale salmon Oriental poppy next brighten the palette and are followed by vivid yellow coreopsis and rust-toned daylilies. The regal lilies bold leaves form spiraled architectural columns and after the coreopsis their flowers open, a beautiful pink counterpoint to billows of silver-leaved artemisia. Pink geraniums in the white Victorian urn bridge the color gap which follows the lilies until annuals, such as petunias, marigolds and zinnias, set out earlier among the maturing foliage of the tulips, have gained strength to usher in hot summer days and stay at their brilliant work until killed by frost. While all the above activity is going on, thyme creeps imperceptibly among the stepping stones, sending up its fragrance only when crushed underfoot. Early this month, with the aid of your garden hose, outline a little garden like this one for your own. Turn over the soil, work in quantities of peatmoss or compost and 5 or 6 pounds of garden fertilizer. No need to be fussy, because the suggested plants are certainly not. 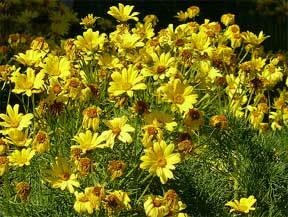 All you will need to order now or buy at the garden center is about eight iris rhizomes, six lily bulbs, three daylilies, two coreopsis, an artemisia, a poppy, a sprig of periwinkle, a few candytuft plants for the area around the urn and a seed packet of creeping thyme. The tulips you might try are planted this month. 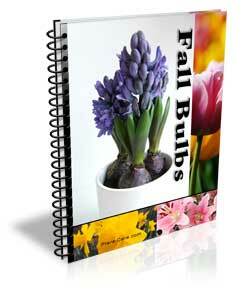 Next spring start your annuals from seed and ready them for spacing between the tulips in early summer.